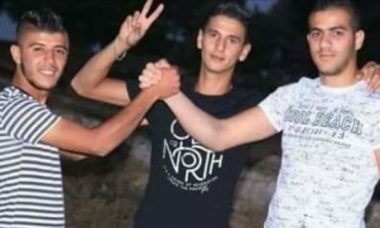 Israeli police on Tuesday rounded up four Jerusalem youths, from Wad al-Joze neighborhood after the charge of hanging posters and handing over brochures in Occupied Jerusalem that praise Martyr Misbah Abu Esbaih on the first anniversary of his martyrdom, according to Israeli 0404 news website. Abu Esbaih carried out two shooting attacks in Sheikh Jarrah neighborhood in the city on October 09, 2016. The anti-occupation shooting attacks led to the death of two Israelis and the injury of six others. His body is still detained by Israeli forces. In a similar context, two Palestinian prisoners in Ashkelon Israeli jail, Ali al-Barghouti from Ramallah and Ibrahim Abu Mustafa from Gaza, have been suffering deteriorated health conditions due to medical negligence policy pursued by Israeli Prisons Service (IPS), according to lawyer of Detainees and Ex-detainees Committee. Captive Barghouti, who participated in the latest hunger strike, said that he is suffering from irregular heartbeat. The IPS has been procrastinating in offering him medical checkup in order to diagnose his condition, he added. As for prisoner Abu Mustafa, who has been detained since 2003 and sentenced to 15 years, he complains of pain in the liver in addition to other problems in the heart and stomach as well as high blood cholesterol. He takes 28 painkiller pills every day, the lawyer highlighted. 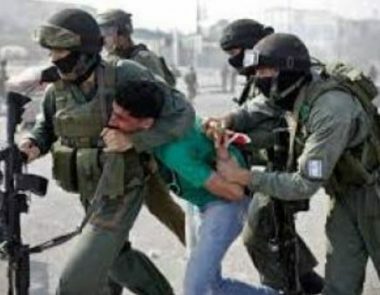 The Israeli occupation forces (IOF) at dawn Tuesday kidnapped seven Palestinian citizens, including two minors, during raids on homes in different West Bank areas. In Nablus, Israeli soldiers stormed Kafr Kalil town and kidnapped a young man called Ahmed Mansour after ransacking his home. Local sources also told the Palestinian Information Center (PIC) that the IOF stormed different neighborhoods in the Old City of Nablus, including al-Qaisariya, without making arrests. In Tulkarem, the IOF kidnapped 20-year-old Khaled Yousef after searching his house in Far'un town. Two teenagers identified as Majed al-Hindi and Mohamed Jabreen were also taken prisoners during IOF campaigns in Beit Ummar town, north of al-Khalil, and Bethlehem. Meanwhile, an Israeli military force stormed al-Arroub refugee camp in al-Khalil and searched several homes, with no reported arrests. 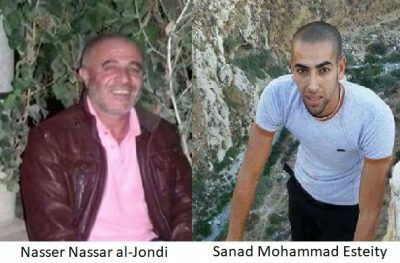 The IOF also raided the home of prisoners Anas and Hamza Nawawreh (brothers) in Wadi Shahin area in Bethlehem. 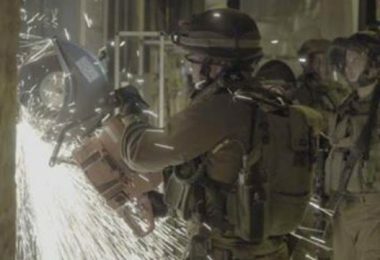 Local sources said that Israeli soldiers brought with them prisoner Hamza during their raid on his home, adding they heard an explosion coming from inside the house. Israeli soldiers abducted, on Tuesday at dawn, six Palestinians, including a child, from their homes, in different parts of the occupied West Bank. The soldiers also invaded Palestinian lands, east of Jabalia, in northern Gaza. Media sources in occupied East Jerusalem, said the soldiers invaded and searched homes, in the al-‘Eesawiyya town, and abducted two young men, identified as Mohammad Ali Nasser and Ahmad Mohammad Dirbas. The army also ordered two Palestinians, identified as Samer Hamdan and Arin Za’anin, who were abducted on Monday at dawn, under further interrogation until this coming Sunday. 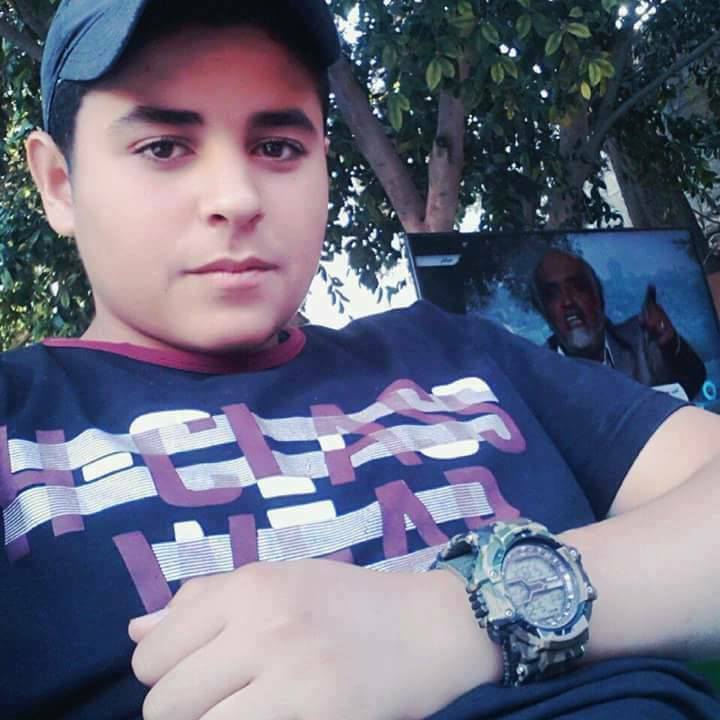 In Hebron, in the southern part of the West Bank, the soldiers invaded homes in Beit Ummar town, north of the city, and abducted a child, identified as Majed Abdul-Aziz al-Hindi, 14. The soldiers also invaded and searched the home of Shehda Younis Sabarna, and attempted to attack him and his family. In addition, the army invaded Yatta town, south of Hebron, and installed roadblocks on Hebron’s northern and southern roads, in addition to main roads leading to Sa’ir and Halhoul towns, before stopping and searching dozens of cars, while inspecting the ID cards of the passengers. In Tulkarem, in northern West Bank, the soldiers invaded homes in Far’un town, south of the city, and abducted Yazan Eyad Yousef, 20. In related news, several armored military vehicles, including bulldozers, carried out a limited invasion into Palestinian lands, east of Jabalia, in the northern part of the Gaza Strip, while military drones hovered overhead. The Israeli Occupation Forces (IOF) arrested Monday evening a Palestinian woman after breaking into her house Yatta town south of al-Khalil. The PIC field reporter affirmed that IOF violently stormed Yatta town and broke into the family house of Khadija Jibril Rabei, 30, before arresting her. A large amount of money estimated at 30,000 shekels were stolen during the raid, our correspondent pointed out. Rabei was then taken to unknown detention center. 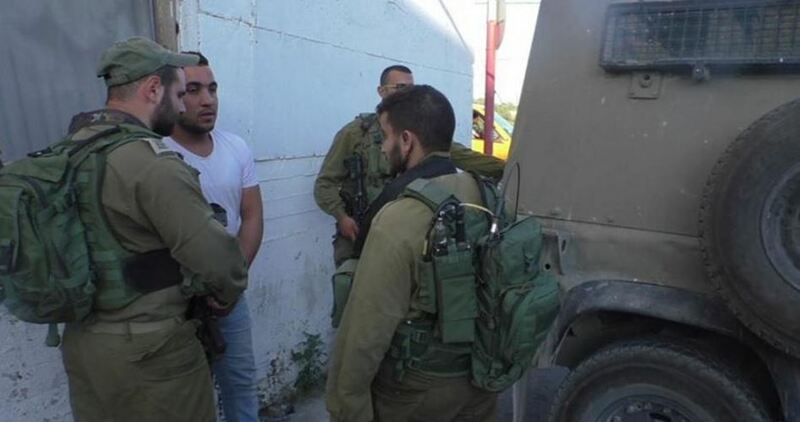 Meanwhile, IOF detained a young man from Kafreit town southwest of Jenin. Majd al-Tamimi, the Fatah Movement's secretary in Nabi Saleh village, to the northwest of Ramallah, was detained by Israeli occupation forces (IOF) on Monday. Eyewitnesses said that Tamimi was detained along with a number of citizens at the entrance of the village before being taken away to an undisclosed detention center. IOF arrest campaigns against the village had escalated over the past few weeks with semi-daily raids into the village being witnessed. Israeli occupation forces (IOF) arrested a Palestinian boy in Erka village, west of Jenin province, at noon Monday while picking olives in his family’s land. Local sources told the PIC reporter that IOF soldiers, stationed at the watchtower of the separation wall established on the village’s land, stormed an agricultural land lot and rounded up the 17-year-old minor Suleiman Husam Yehya. They added that the soldiers were then seen deployed in olive groves at the cultivated land lots near the apartheid wall. 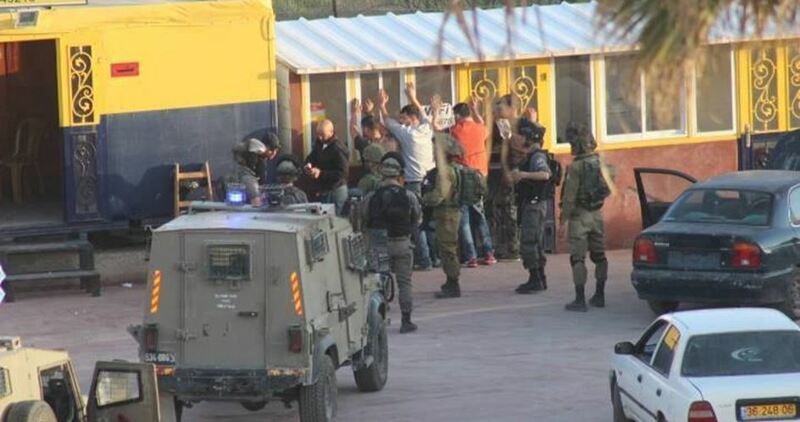 The Palestinian Prisoners Society has confirmed that Israeli soldiers have abducted, on Monday at dawn, seven Palestinians, after invading the searching their homes in the West Bank governorates of Jenin, Qalqilia, and Bethlehem. The Jenin office of the PPS said the soldiers invaded homes in Jenin refugee camp, and abducted three Palestinians, identified as Ahmad Fakhri Hweil, Tareq Abu Sbeih and Talal al-Hosary. The soldiers also invaded many neighborhoods in Jenin city, and installed roadblock main roads leading to Zabbouba village and Ya’bad town, before stopping and searching dozens of cars, and interrogated many Palestinians while inspecting their ID cards. In addition, the soldiers invaded homes in al-‘Azza refugee camp, north of Bethlehem, and abducted Maher Mahmoud Abu Tarboush, 43, while Nasri Yousef Abu Jouda, 25, from Bethlehem city, was abducted near Etzion junction. In Qalqilia, in northern West Bank, the PPS said that the soldiers abducted Ezzeddin Nofal, 18, and Tarbakan Mohammad, 24, from their homes. 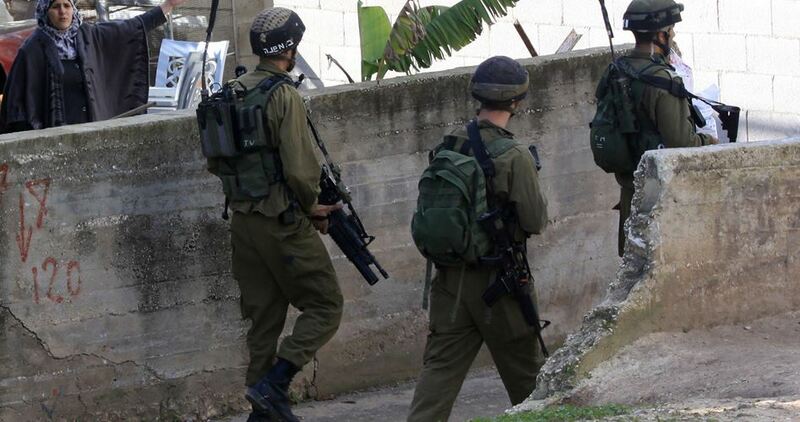 The soldiers invaded and searched many homes in the city, and interrogated several Palestinians. Israeli soldiers abducted, on Monday at dawn, nine Palestinians, including two children, after invading their homes and violently searching them, in Hebron, in the southern part of the occupied West Bank. The Hebron office of the Palestinian Prisoners Society (PPS) said the soldiers invaded many homes in the city, and abducted Mohammad Hasan al-Ja’bari, 41, Fuad Rashid Eskafi, 34, Musleh Abu Sbeih, Ammar al-Jamal and Mohammad Hazem Qfeisha, 22. 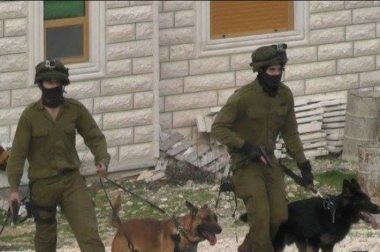 Several army vehicles also invaded Beit Ummar town, north of Hebron, before the soldiers searched and ransacked homes in the town’s center and al-Hara at-Tihta area, and abducted four Palestinians, identified as former political prisoners, Moayyad Waleed Ekhlayyel, 24, and Mohannad Ali Abu Ayyash, 20, in addition to Odai Bassam Za’aqeeq, 16, and Khaled Mahmoud Sleibi, 15. The abducted Palestinians were all moved to Etzion military base, north of Hebron, after the soldiers handcuffed and blindfolded them. The soldiers also invaded many homes in Hebron city, and Yatta town, and installed roadblocks on roads leading to Sa’ir and Halhoul towns, and Hebron’s northern entrances, before stopping and searching many Palestinians, and their cars, and examined their ID cards. Head of the Studies Department at the Prisoners’ and Ex-Prisoners’ Committee, Abdul Nasser Farwana, urged the international community and human rights institutions to take urgent response regarding an Israeli verdict sentencing an ex-prisoner to life. 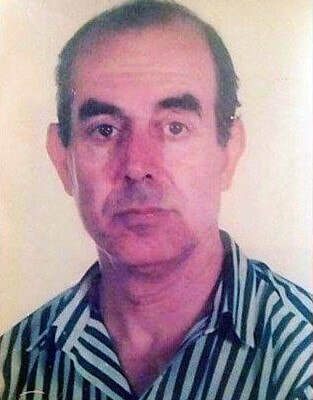 According to Farwana, the Israeli occupation authorities re-sentenced 72-year-old Youssef Abu al-Kheir to life, 34 years after he was released as part of a prisoner-swap deal struck in 1983. Farwana condemned, in the strongest terms, the life sentence issued against Abu al-Kheir, whom he said was re-arrested on his way to Akka (Acre) city last May to visit his family following a forced-deportation period of over 30 years. He added that Abu al-Kheir, has been diagnosed with several health disorders. The activist warned of a pre-planned Israeli scheme to restore the sentences of Palestinian detainees released in previous prison swap deals. 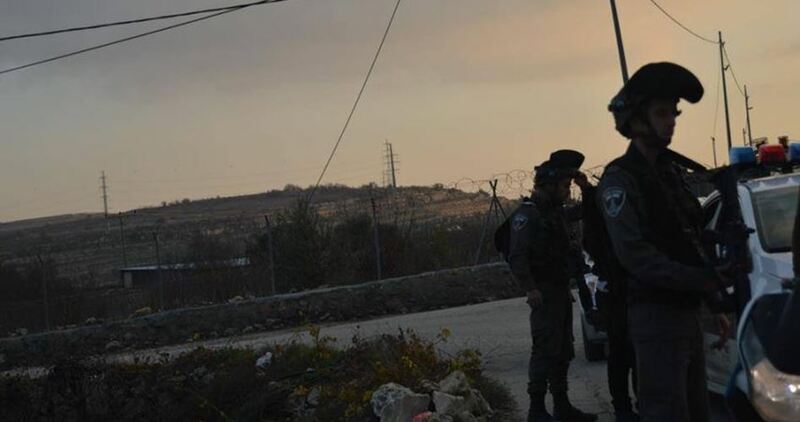 The Israeli occupation forces (IOF) on Saturday evening kidnapped two Palestinians at roadblocks in different West Bank areas, and barricaded all roads leading to Azzun town, east of Qalqilya. According to local sources, Israeli soldiers rounded up 44-year-old Naser al-Jendi, a resident of Yatta town, at a makeshift checkpoint they set up at the main entrance to al-Fawwar refugee camp, south of al-Khalil city. The soldiers detained Jendi after intercepting and searching the public vehicle he was aboard and checking the IDs of all passengers. The IOF also kidnapped on the same day another Palestinian young citizen, from Jenin refugee camp, as he was traveling on a road to Ramallah city. Local sources told the Palestinian Information Center (PIC) that the family of the young man, Sanad Satiti, came to know later that its son was arrested by the IOF from aboard a car heading for Ramallah. 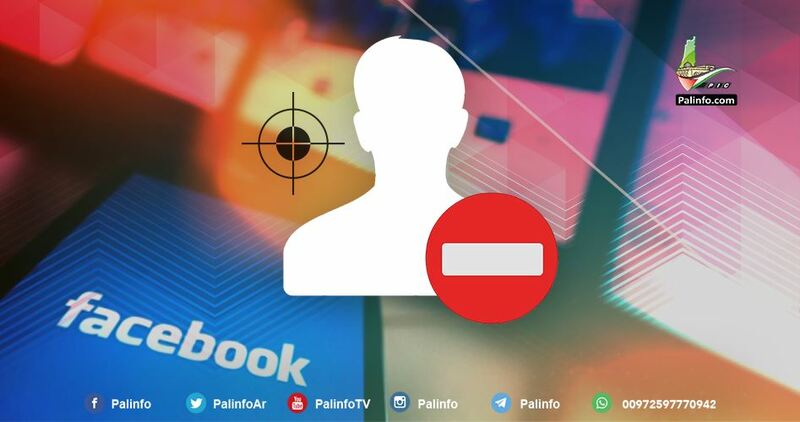 In another incident, the IOF closed all entrances to Azzun town, east of Qalqilya, and prevented local residents from going in or out before thoroughly searching them and their vehicles and checking their IDs. Eyewitnesses reported seeing soldiers raiding homes in the town and patrolling its streets, without knowing the reason for the IOF campaign. Israeli police rounded up on Saturday three Palestinian children from Negev in 1948 Occupied Palestine at the pretext of throwing stones at settlers’ cars on Road 60 in Negev. In a statement on Saturday, the police reported that the three detained minors were taken to an investigation center in the area. The Palestinian Prisoners Center for Studies said that 450 Palestinians, including women and children, have been arrested since the outbreak of the Jerusalem Intifada in October 2015 on charges of "incitement" on Facebook. Media spokesman for the Center, Riyad al-Ashqar, explained that Israel uses what Palestinian youths publish on social media sites as pretexts to detain them on charges of incitement and impose actual or administrative imprisonment sentences on them. Ashqar pointed out that the detainees included journalists, children and women, adding that an administrative detention order was issued against the Jerusalemite female prisoner Sabah Fir'oun and renewed four times in a row for the same charge. 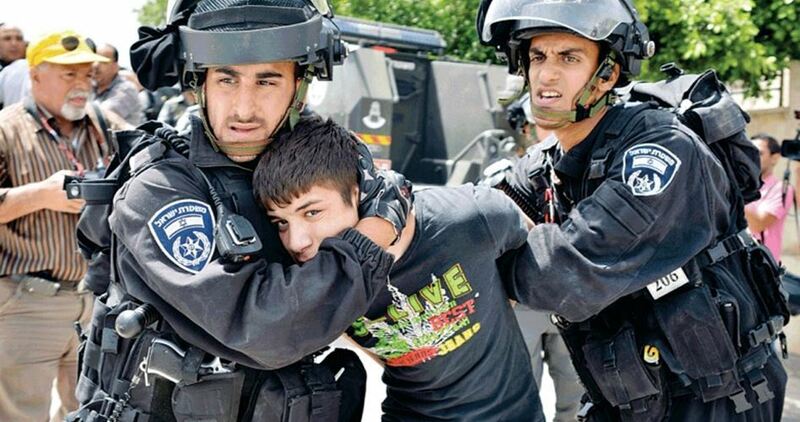 Ashqar said that Israel has established a special cyber unit to record all that is published by Palestinian youths. Israeli courts claim that posting statements honoring martyrs or videos documenting the Israeli crimes indicates a psychological readiness to carry out anti-Israel attacks. He noted that the Israeli prosecution presents to the court a file containing dozens of printed Facebook posts as evidence of the Palestinians' willingness to harm Israel's security. He cited the case of the Jerusalemite journalist Sanaa Dweik who spent 6 months in Israeli jails on charges of incitement because she used words like "Intifada" and "martyrs" in her press work though these terms are widely used in the Palestinian and Arab media. In similar cases, the Israeli authorities imposed an administrative detention order that was renewed twice against the ex-prisoner Su'ad Erziqat, 28, and sentenced Ahmad Sa'ida, 17, to 11 months on charges of incitement on Facebook. Since these arbitrary sentences were not enough for Israel, according to Ashqar, those released are ordered not to use Facebook for a certain period of up to months, and they may be fined or held in house arrest. 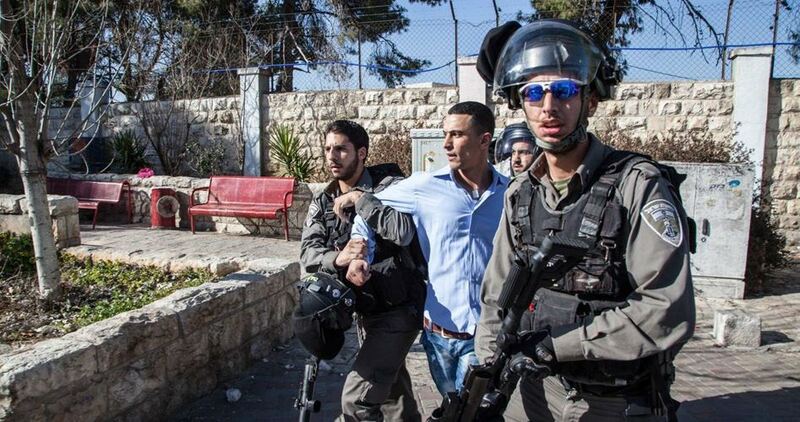 Ashqar stressed that arresting Palestinians because of their opinions is contrary to the international conventions and laws that allow freedom of expression, calling on the international community to intervene and put an end to the Israeli violations. The Israeli occupation forces (IOF) at dawn Saturday kidnapped a 17-year-old student suffering from a rare medical problem from his home in Jenin in the West Bank. A family source said that Anas Hamarsheh suffers from a rare disease called “Perthes,” which is a childhood hip disorder and causes paralysis before the affected child becomes an adult. The source added that Israeli soldiers tied the hands of Hamarsheh behind his back and took him to an unknown place for interrogation. 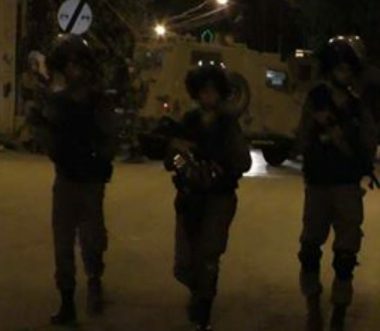 Israeli soldiers invaded, on Saturday at dawn, Bethlehem city, and Wad Rahhal village, east of the city, abducted two Palestinians, including a teenager, and confiscated one car. The Bethlehem office of the Palestinian Prisoners’ Society (PPS) said several army jeeps invaded the Saff Street, in the center of the city, searched homes and abducted Emad Ali Shweiki, 45. The soldiers invaded Emad’s home, and searched it, looking for his son, Mohammad, who was not at home, and abducted his father instead. In addition, the soldiers invaded Wad Rahhal village, south of Bethlehem, abducted Noureddin Ibrahim al-Faghouri, 17, after searching the family home, and confiscated his father’s car.